Hot Food, Ready When You Are. Our Snack Wagon provides hot food and snacks each weekend. 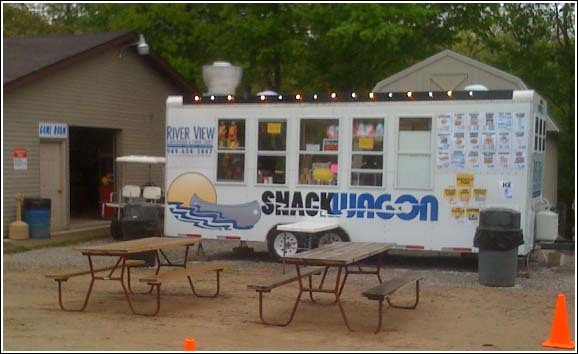 The snack wagon is located in the center of our park, near our recreation center and river trip bus-stop. After a long day on the river, stop at the snack wagon on your way back to your campsite and let us handle cooking your dinner, then kick back and relax. Our menu will include the usual snack bar fare. Did you forget some essentials for your river trip? We're looking for suggestions on new menu items this season. If you have a craving for something special, let us know! We are always looking to improve our efforts! Send your suggestions in via email! To prevent infectious tree diseases, we do not allow outside firewood to be brought into our campground.